So apparently, it’s summer…And what does a good old British summer mean? No, not sunshine, silly! Festivals! Music lovers will flock in their thousands to festivals all over the UK over the next couple of months. If you’re one of them, we’d like to take the opportunity to help you perfect your festival wardrobe! Jewellery might not be the first thing you think about when you’re packing your outfits, but remember that it’s your accessories that will keep you looking glam when your clothes are soaked in mud! We’ve picked out five super-versatile pieces of jewellery that will carry you right through the festival season. We’ve stuck to natural materials and neutral colours, so these gorgeous little must-haves will go with any outfit you throw on! We love this necklace! We’ll be wearing ours over plain t-shirts and denims as a gorgeous, natural statement piece. Us ladies know only too well that you often have to choose between beauty and comfort. Well, not with these earrings – they’re lightweight and comfortable to wear, but still hold their own in the style stakes. Perfection? I think so! These bracelets are a real bargain. Wear one on its own to add an ethnic touch to your outfit, or layer them for a bolder look. The most versatile piece of the lot! The shells and pearls bring out the natural luminescence in the skin – well, every little helps when you haven’t been near a shower in three days! Wear it long or short around your neck, wrapped around your wrist as a bracelet, or even in your hair wrapped around a bun or as a headband! Simple but stunning, but this fabulous brass cuff is a real statement piece for the wrist and it will go with everything. Since we got back we’ve been updating the website with some of the beautiful new jewellery that we’ve chosen especially for you. There are some stunning pieces in there, including two limited edition ranges from Kazuri, which I hope you’ll love! Because they’ve been so popular with you, we’ve also expanded the Nchebe range of earrings from South Africa to include a lovely blue and silver variety, as well as this vibrant pair in “Peacock”! There’s lots more still to come, so make sure to check them out on our website, and don’t forget that all of our jewellery is handmade, unique, fairly traded and very, very beautiful! At times, particularly in the last ten years, it’s been easy to forget that South Africa in its current form is merely a child; the cities are modern, the restaurants are famous for their incredible cuisine, the airports function well and the roads are clean and well maintained. Drive away from the airport and down one of the main roads however, and you’re likely to drive past numerous informal settlements which serve as a stark reminder that South Africa is still struggling to find its way in the world. Today, April 27th 2012, marks eighteen years since the first post-apartheid elections were held; the first elections where all South African citizens were free to vote as part of a constitutional democracy. Today is Freedom Day, but although democratic South Africa has turned eighteen, the benefits of freedom have yet to reach many South Africans. Hello friends! It’s been a while – what a lot we have to catch up on! Firstly, I hope that you all had a wonderful Easter and that you had the time to enjoy the beautiful spring weather before the April showers arrived! Secondly, I must apologise for my lack of communication lately. As you may know from previous posts/Twitter/Facebook, we have been back to South Africa (more about that in a minute!) and although we had hoped to give you frequent updates, we soon found out that the internet at our accommodation in Cape Town was…unreliable. Since we got back we’ve been super busy catching up with everything and preparing the new Spring/Summer stock which will make its first appearance online this week! So without further ado, here we go with a couple of posts to catch you up on what we’ve been doing! If you follow our blog, you might know that Evoke Africa is a family business run by myself (Naomi) and my husband James. I am half South African and my mother’s side of the family still reside in and around Cape Town, including my grandparents who I fondly refer to using the Afrikaans words for “granny” and “grandpa”; “Ouma” and “Oupa”. I’ve grown up being encouraged to nurture and embrace the South African part of my identity, and it is as much of a home to me as the UK. It is my connection to this incredible continent that led me to set up Evoke Africa, and you can read more about that in our first blog :) I hope that my account of our visit won’t bore you too much, and will instead encourage you to take the plunge and experience South Africa for yourself! The trip we have just taken to South Africa is one of the most special I will ever take; we celebrated our second wedding anniversary, met some amazing people whose work we greatly admire, and also had the privilege of showing two of my old school friends around the Western Cape. Having listened to me rave about South Africa for over a decade, I can only hope that their holiday lived up to the high expectations that I set for them! The aim of our first week was to relax, so having landed in Cape Town I arranged for us to spend our first week exploring the delights of the Garden Route. We based ourselves in Wilderness, a place which I’ve come to love for its tranquility, and turned off the roaming function on our phones to allow us to enjoy a break from the world. The weather was variable; from baking heat to spectacular lightning storms. We traveled through mighty mountain passes, beautiful coastal roads and through the baking semi-desert landscapes of the Klein Karoo. We saw seals, ostrich, Knysna Loerie, tortoise and consumed fresh seafood and delicious cocktails. As happens on holiday, time took on a different meaning; by the time late afternoon came, the mornings felt like they’d been part of another day entirely…And yet, before we knew it, the week was over and we were back on our way to Cape Town feeling refreshed and ready to take on all the adventures that Cape Town has to offer! While we’re away, you can still order things on the site, but we won’t be able to send out any orders until we get back on the 12th of April. Check out our Twitter for updates on what we’re up to, and we’ll try to keep you posted here with any news / photos. As promised, here’s the first of three blogs taking a look at some of Evoke Africa’s favourite Fairtrade goodies. Personally, I can’t face the day until I’ve had my first cup of tea. I’m sure that I’m not alone on this, so it seemed logical to start with a blog on beverages! My tea of choice is the “Organic Fairtrade Tea” made by Good Earth, currently the only Fairtrade tea in their range. I admit that I’m quite unadventurous when it comes to tea; I doubt I’d be able to tell the difference between a cup of the fruit and herbal varieties from a cup of bath water!). I grew up in a PG Tips household and it took me a while to find my perfect Fairtrade replacement, but this one by Good Earth passed the taste test with flying colours. Now it’s a firm favourite in the Evoke Africa office too! If you do like drinking bathwater, I mean herbal tea, then there are plenty of Fairtrade options for you to try! It would be strange for me to talk about herbal teas without mentioning South Africa’s most famous herbal tea; rooibos. Rooibos (or redbush) tea has really been taking off here in recent years. Some people enjoy it with a little bit of lemon and honey, some with milk. Some enjoy it plain. However you enjoy yours, try to find a Fairtrade version like this one from Sainsburys. Of course, tea isn’t everyone’s cup of…well, you see where I’m going with that. Sometimes only coffee will do! As with tea, there’s now lots of varieties of Fairtrade coffee to choose from; in fact, there are whole chains of coffee shop which sell only Fairtrade coffee. How’s that for progress?! When it comes to coffee, again, I’m not much of a connoisseur. I love coffee and I’m happy with pretty much anything that comes my way, so as you might imagine, it didn’t take long for me to find a Fairtrade alternative that I enjoyed. 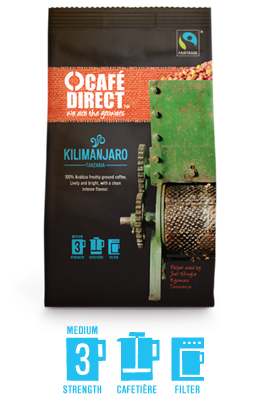 My coffee of choice is Kilimanjaro made by Café Direct and this product description is pretty much why; “Grown on the fertile red volcanic soils of Mount Kilimanjaro, this coffee is made from the finest Arabica beans, watered with pure mountain streams from melting snows at the summit.” If there’s a better scene to imagine while you enjoy your mid-morning caffine-fix, I can’t begin to imagine what it is! I must admit to not having tried Ubuntu Cola myself as I’m not particularly fond of cola drinks, but the name alone makes it worth a try if you are! “Ubuntu” is a popular concept in South Africa, referring to a society built on the idea that an individual’s success is dependent on the success of the others in their community; as humans we are all linked. Ubuntu cola was the first Fairtrade cola in the UK, and through Fairtrade and the commitment to donate at least 15% of their profits to the Africa Programme, it sounds like they’re taking the spirit of Ubuntu seriously! Click here to find your local stockist. We started with the perfect drink to kick off the day, so it’s only right that we finish with the perfect drink to help bring it to a close! We’ve gone for something a bit special with the Co-operative Fairtrade Sparkling Brut/ Sparkling Rosé, South Africa. A lot of critics have stuck their noses up at Fairtrade wines, but this is one that has managed to seriously impress reviewers. Now’s the perfect time to try it as The Co-operative are offering 20% off a lot of their Fairtrade products, including this wine which is now £6.39. Bargain! This is just a little taster of the Fairtrade goodness that’s out there, so if you don’t like the look of the products we’ve chosen there are plenty of alternatives to be found on the shelves of your local supermarket – just keep an eye out for the Fairtrade symbol when you’re doing your weekly shop. Half the fun is in the tasting, so experiment and let me know how you get on! You might have noticed that there’s been a bit of a buzz in the world of social media lately, especially amongst those who are passionate about ethical consumerism. That’s because Fairtrade Fortnight started today! This alone would be a good enough reason to get excited, but we’re especially happy about it here because it’s Evoke Africa’s first one! To get you as excited as us, we’d like to offer a tempting 15% off all our jewellery for the next two weeks! If you’ve been following us for a while you’ll probably already know that we’re extremely passionate about ethical trading, whatever the products involved. After all, we’re one of the few retail outfits in the UK that only sells jewellery that has been purchased from British Association for Fair Trade Shops and/or World Fair Trade Organisation accredited sources! We long for the days when we can walk into any shop or supermarket and feel reassured that the products we find on the shelves have not been brought to our shelves through the exploitation of anyone or anything, and organisations like the Fairtrade Foundation are making that possible. In their most recent blog, they say that 42% of all sugar bought in the UK is Fairtrade, which is incredible progress. This year the Fairtrade Foundation is asking that we all take a step for Fairtrade. How? Well, as they say on their website; “Your step for Fairtrade can be as simple as trying a new Fairtrade product, or as big and bold as launching a campaign to get your whole town to go Fairtrade. Every single one counts, because together they lead to life-changing projects in developing countries. We’ll tell you about some of these when you register your step”. For example, you could buy some Fairtrade coffee. Maybe you could even introduce it to friends, colleagues & family to convince them to buy Fairtrade too! So it’s that time of year again – cheesy poems, sappy love songs and heart shaped everything are, well, everywhere. Valentines is a controversial time of year and whether you love it or hate it, you definitely can’t escape it! We’re well aware of how clichéd the day has become, so we decided not to bombard you with endless promotions for every piece of red jewellery that we sell (although I will be wearing my gorgeous red Kazuri earrings to dinner!). Instead, we’ve decided to reclaim it. See, here at Evoke Africa we like to think that Valentine’s Day should be about one thing and one thing only; love! Love for your significant other, love for your friends and family, love for yourself and maybe even love for people that you’ve never even met but still make your world a better place. With the constant stream of bad news from all corners of the earth, not to mention the depressing time of year, we could all do with a little bit of loving! How you can help us keep our New Year Resolutions! Belated New Year wishes, and thanks for reading our first blog post of 2012! Christmas has been and gone (in the blink of an eye, it seems) and January is in full swing. How are those January blues going? Did you make resolutions? Are you sticking to them? This time last year we were working hard on our New Years Resolution to make Evoke Africa a reality. I knew how special this ambition was to us; to have the opportunity to work with these beautiful little pieces of Africa whilst supporting causes that we’re passionate about is incredible. What I didn’t realise at the time was how special it could be to interact with people as an online retailer. When we launched Evoke Africa, my main concern was that our customers might feel disconnected from us; that giving their experience that special “personal touch” would be so much harder online. I needn’t have worried. Between this blog, our Facebook page, Twitter and customer emails, I’ve been overwhelmed by how many people share the same passions as us! When I look back at the last year, the moments that really make me glow inside have very little to do with what we’ve sold. They’re from interactions that I’ve had with you! Seeing how much magic Africa still holds for you. Discovering how much passion you have for the beautiful things that we love too. Learning how much fair trade means to you. Helping men choose wedding gifts for their wife-to-be. Helping daughters choose birthday gifts for their mothers. I’ve loved every minute of it! This year, our resolution is to start building upon these foundations. We want to give you more variety, more beautiful on-trend jewellery from a wider range of brands and producers. We’ve barely touched upon the talent that is out there, so it’s time to get really stuck in! Right now we’re working on our Spring/Summer ranges, and I think you’re going to love what we’ve found so far! Finally, our long term goal is to make Evoke Africa strong enough to start forming a relationship with some relevant charities. We firmly believe that businesses have a responsibility to make a positive contribution to society on a level that might not be achievable on an individual level, and that is what we strive for. But it all depends on you. We need your help and support to spread the word and grow big and strong so that we can really get in there and start changing the world! I don’t know about you, but the dry, sunny weather that we’ve been having so far this Autumn/Winter has lulled me into a false sense of security. Intellectually, I know that Christmas is only twelve days away. All the normal signs are there; Christmas songs are on the radio, the Christmas lights are out in full force, and every second advert on the TV is for perfume or aftershave. In spite of all of this, somehow it just hasn’t clicked that it’s time to get festive and I’m feeling eerily calm. GIFTS! That’s right! The thing that I love most about Christmas is giving gifts! So, to help you find the perfect last-minute gifts for your loved ones, we’ve taken 15% off the price of our beautiful Kazuri and Made jewellery. There, I feel more festive already! Don’t forget that when you make a purchase from us, you’re helping to support fair trade between the UK and Africa, and honestly…I don’t know if I can think of a better time than the “Season of Goodwill” to support such an important movement. Now, where have those mince pies gone..? !